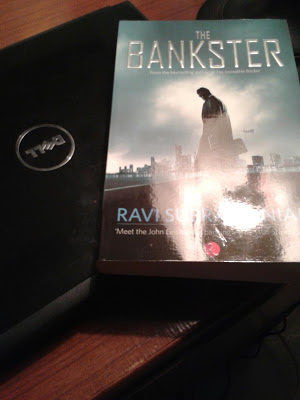 NumeroUnity: Book Review- "The Bankster"
The Banker with gangsters and mobster, makes for an interesting reader! Bankers build their careers on trust, or so everyone thinks, till a series of murder rock the GB global bank putting it's reputation at stake. Who is behind these killings? What is the motive? Is the banker at GB-2 fast turning into a bankster? Or was he always one? In this maze of puzzles, questions and murders the author takes us through a gripping thriller in the quest of solving those puzzles, questions and murders. The bankster is a story set in 3 different cities- Angola, Kerela and Mum-bhai! It's a story that runs through these cities, intertwined, gripping and bores the true Ravi Subramanium style with a new international edge that a lot of crime thrillers are made of. Set in Greater Boston Global Bank, involving its employees and mafia and secret agencies. One story, 3 parallel tracks, ultimately combined to one single plot- Bankster. In Angola a covert CIA agent is about to exchange weapons for blood diamonds whereas in Kerala an elderly man will do whatever it takes to fulfil a promise made to dying son. And in Mumbai an international bank is stunned by the mysterious deaths of its key employees. What intrigued me more is the book cover that happily stated- meet the John Grisham of Banking. Not bad, it just helps heighten up the expectations from the book. Well, I would not say he is John Grisham or not, I would rather like him to be Ravi Subramanium of India and let authors of world compete with him. And I did liked the cover page (if you wondering why am talking about cover page- well my friends, a lot of books get sold as per their label), the image could have been better. The story, narrative is easy to read. The Ravi S touch is definitely there, scaling to new horizons. Yes it was a good attempt overall? Question is- like I always say- Can it supersede his other novel which remains my favorite- if God were a banker, well my answer would be-may be. The plot is mainly on money laundering and written in fashion of tales of 3 cities- how fictitious assets etc are used- misused to facilitate illegitimate funds transfers. Author has used real life incidents too in the book like- Koodankulam nuclear power plant protests, Fukushima incident, Chernobyl incident which makes this story feels realistic. Author also plunged into the temptation of re using his characters from previous novels hitherto like Karan and all. I am waiting for this to be converted in a movie, and am sure with proper execution it will make a good one. It has all the potential. Do go for it if you are in Banking or allied services or like reading crime thriller or loved Ravi's previous books or never heard of him still. When I first lay my hand on this book, I was amazed somebody could write a thriller keeping bank in the backdrop. Nice review! Thanks Meenakshi. I am waiting for this book to be made in a film in India. what say? Its more or less the same premise in every book..
Agree. I too have similar observation. In fact a lot of authors get typecasted in the genre they write. That is a fine analysis of the book. Being a banker myself I am finding it hard to bypass the book. Maybe I'll pick it up sometime soon. Thanks for sharing. I am in the finance field and when I first saw this book on Flipkart, I was very excited. Sometime as soon as you see a book, without reading any reviews, you have a strong feeling that you should read this book. The same feeling I had. Thanks Prashanth. i am really glad that you liked and it and welcome to my blog. You need not have to read author's previous book to read this. But in case u want, you can go ahead and read for that was a lovely book! Cool...do share your feedback with me...happy reading!!! Sounds interesting! I would love to explore that. Oh now i will borrow this book from u ...sounds interesting! I haven't read the book....looks good! Will surely try to read it..
:) As you like it, lady! Thanks. Do read and share your feedback here!